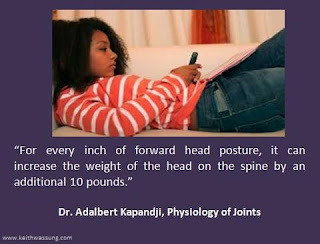 Poor posture has devastating long term effects on our body. As our posture is the window to our spine it puts more stress on our nerve system than any other physical stress. Nobel recipient Dr. Roger Sperry says that the spine is the motor that drives the brain. Loss of the cervical curve creates tension on the spinal cord and interferes with the signals from the brain to the body. This can create a long list of health problems. Neck and back pain are the obvious health problems, but few realize that loss of lung capacity can come from forward head posture. This can lead to asthma conditions and even heart disease. Headaches, muscle strain, disc herniation, arthritis, and even TMJ can be caused form abnormal neck posture. In fact, a double crush problem in Carpal Tunnel Conditions of the wrist can come from the neck because the neck posture is always the first level of nerve pressure. Subluxations are misalignments that affect nerve function and occur in the spine or extremities. Poor posture over time will compress the lower neck nerves leading to chronic shoulder, elbow and wrist problems. As a Chiropractor for more than 28 years, I evaluate where the problem is coming from instead of the common method of masking the symptoms with medication. Of the many challenges poor posture creates Carpal Tunnel Syndrome costs individuals and businesses millions of dollars annually from potentially unnecessary surgeries. These conditions are not only treatable but preventable with proper care. 2) LOOK AHEAD- Always make sure that your computer is directly in front of you and your visual field is in the middle of the screen when sitting upright. 3) READ ON- When reading, rest your book on something that raises your reading material to at least a 45 degree angle. This helps maintain a proper cervical curve and is also better for your eyes. 4) MOVE IT- Take time away from slumping. When sitting (including driving) set a timer for every 45 minutes to get up and stretch to prevent long periods of stress on your spine. 5) PACK IT -Backpacks and purses are generally improperly designed. Make sure to use a properly designed backpack and distribute weight evenly. For purses, unload them! Be sure the base is wide enough to distribute what you are carrying. See our backpacksafety http://www.applestozen.blogspot.com/2012/10/back-pack-safety-for-everyone.html article for more ways to prevent injury or permanent damage. 6) SLEEP SOUNDLY- Sleeping is best done on our backs. Never our stomach! Make sure you have a supportive pillow (only one is necessary) and a small pillow can be used under your knees to take pressure off the low back. ways to maximize your workouts and your health. 8) FEET COUNT- a good shoe is worth more to your health. High heels change the alignment of your body and can cause subluxations. 9) A CRICK- Use a headset for your phone whenever possible. Holding a phone from ear to shoulder causes multiple problems. As well as constantly looking down at a phone. 10) Get a spinal checkup to learn what is best for your spinal health.